With only one week left before Independence Day, what better way to get into the festive 4th of July spirit than a fun red, white, and blue styled soirée! You just can't go wrong with our nation's flag colors, and adding a touch of lighter blue to take it to a more sophisticated level. Now, who doesn't love a fun and big balloon garland? I know we all do and for that reason I decided to give it a try for the FIRST time and I cannot complain. I think it turned out super cute, but from my end, I should say, there are definitely some tricks I need to get better at. I guess practice makes perfect! I think it looked perfect as a fun backdrop, what do you think? Now lets talk desserts and let's talk about the amazing (and edible) centerpiece - the cake! The flag-themed, two-tier delectable was covered in red, white, and blue fondant - very simple and modern - and placed on a white cake stand. Of course a USA topper was a must! From the cupcakes to the cookies, the theme was spot on with each. 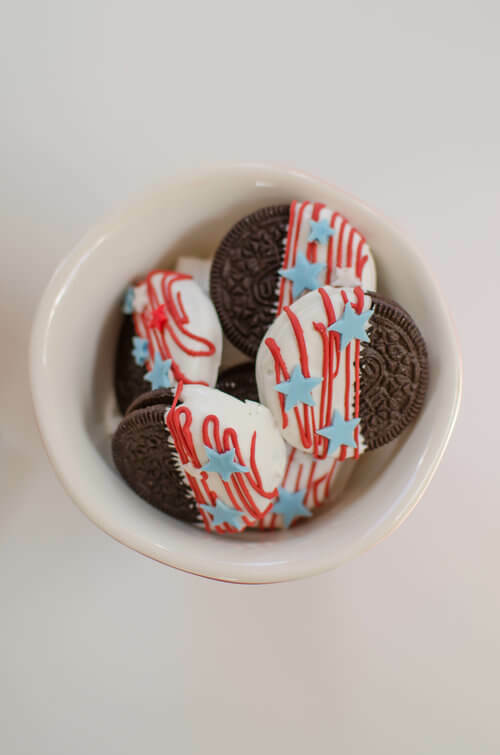 The dipped and decorated Oreos were a fun way to bring color to an otherwise theme-less dessert and the cupcakes were are hit too. Who can pass up anything on a stick? These Krispy-treats are beautiful with a little dip, sprinkle, and barber-shop straw. And last but not least.. the cookies! They were almost too beautiful to eat! My friend Marta from Sweet Carousel Cakes did it again! Isn't she such a great and talented baker! Lets move on to the guests' table. What is Independence Day without fireworks? No need to wait until dark for a sky display. The hand-made table display wow's guests the same. You only need pre made tassels and some star cutouts and lay them out as a centerpiece. Easy-peasy! For the place settings I used a red and white stripped dinner plate, and I also used a smaller plate with the American Flag in the shape of a heart. Since I love love mason jars, I decided to use them for our drinks. But if you know me well, a simple mason jar wasn't enough, so I asked my sweet friend Emily from Pedaller Designs to design some straw flags and labels for me, and she out did herself! I love them!! The "Land of the free", "Home of the brave", and "Party like it's 1776" printables used on the mason jars where first hand-written by Emily and then converted into a digital file for printing. So there is no way you can find this font anywhere. This is truly a one of a kind printable. Now guess what?? Emily and I are so excited to tell you that this printable was added to my Subscriber's Lounge, so if you already hang out there, you can download them here. A quick fun detail... If you look closely below, the bottom of the jar says "Made In The USA". How cute is that? So while I was finishing setting up the table, I realized I hadn't used all of the water labels and straw flags and I was gonna toss them, so I came up with the idea of cutting out some straw flags in the middle and use them as "ribbons", I also cut out the water labels where the saying is and place it over the paper ribbon to create a medalion for the paper bag that I used to put the wooden cutlery. I think it was a nice touch and a different way to show you how to use the printables. Another fun detail that I added to my table are these super cute napkin rings. I teamed up once again with my super talented friend Abby from Fete Gazette and she came up with this unique DIY and I am also so excited to tell you that this is available at my Subscribers' Lounge. Hope you all are ready and inspired to celebrate such a fun Holiday!